Today's post comes from Imagine's newest team member. Stacy Bouchard joins us with more than 20 years of deep marketing experience. She'll be serving as our marketing manager as well as an account manager for clients. Like many of you, I am a marketer. Marketing is what I do. And throughout my 20+ years, I have really liked my work. There is a wide variety of work to do as a marketer. Perhaps, that is why I was drawn to it. I have had the opportunity to do everything from copywriting to event management to strategic planning…and a whole lot of other things in between. It is hard to get bored as a marketer. As my career began, I believed that everyone loved marketing and that it was a key component in successful organizations. It didn’t take long for me to realize that not everyone loves marketing. At first, I was shocked. Why would my peers in other departments minimize the value of what we do? After all, we were the ones producing the beautiful copy, ads, trade shows, websites, proposals, presentations and events that were contributing to the bottom line. Right? I’ve always worked in technical fields with technical people – primarily engineers and some accountants. And I’ve always worked with sales people – some technical, some not. Their perspective on marketing is slightly different than mine. Many of them view it as a necessary evil. Even the sales people – I think that was the biggest shock to my ideal. I thought sales and marketing were supposed to be a team or at least partners with the same end goal in mind. While my experience has been primarily in technical fields, I've learned that this is a common occurance in most industries. At first, I took the negativity personally and felt bad about it. Here they were, CEOs, COOs and even sales people in large firms and they were skeptical, at best, about marketing. When I realized that this feeling towards marketing stretched all the way to the top, I decided that I needed to understand why. I felt we were contributing and adding a valuable skill set to the organization but I found myself in the minority – with my marketing colleagues. As I worked with people on marketing tasks that required input from leadership and the technical staff, I started asking them a lot of questions about their view of marketing as a whole. I also tried to figure out what I could do to convince them that marketing did add value and contribute to the success of the firm. In response to my questions, they asked a lot of questions of their own. Like, how do you measure return on the post card mailing we just sent out? And how do you prove that the ads we’re placing and spending lots of money on are really producing any concrete results? What about the events? Can you prove that our customers or prospects purchased something from us as a result of attending an event? Or how can you justify the thousands of dollars we spent on printing brochures that will be outdated in six months? WOW – they really didn’t believe anything we were doing had any impact – and it was primarily because I could not provide them with black and white evidence that our tactics were working. As I thought more about their questions and struggled to identify ways to measure, I started to believe they were right. Deep down I believed that what I was doing was making a difference but I could not prove it. At the end of the day, I really didn’t know if I had won or lost. Did someone call us because they saw our ad in a trade publication? Did they love our brochure so much that they purchased additional services? Did they even look at the direct mail pieces we were sending out? I made providing concrete results a priority moving forward. For some things, it was easy to do. Events and trade shows provided an easy opportunity for measuring results based on leads gathered and key accounts in attendance. Other things were not as easy but I kept trying. My positions and companies changed but measuring marketing results really didn’t. I felt like I was supporting the organizations I was with in a meaningful way but also always felt like I could be doing more. As my responsibilities grew, I continued my quest to prove the value of marketing. I did research and read articles about marketing in general and marketing specific to my industry everyday. New ideas about marketing were starting to grab hold in certain industries. Social media was growing. I could sense that the marketplace was changing. The inbound method was popping up everywhere in articles. Not everyone called it inbound but it was definitely a new approach worth considering. I started to read as much as I could about it…and I loved it. I loved that it was friendlier, measurable and cost effective. I immediately started to see how it could impact the bottom line in a positive way. I could see that there was a way to convince the sales people we were truly supporting their efforts. How could leadership argue with something we could measure so precisely with so little cost? I attended a full-day workshop on inbound marketing. I attended HubSpot’s Inbound 2014. I started to network with people I knew were using an inbound approach. I immersed myself in it and decided that I wanted to be an inbound marketer. My marketing fire had been reignited. There are lots of posts out there about inbound marketing. My purpose today is not to teach you the inbound methodology. 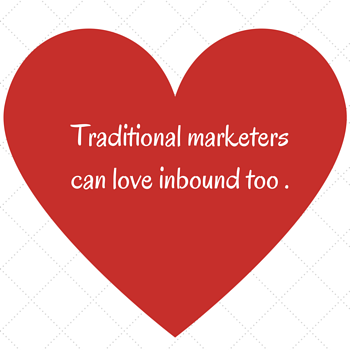 It is simply to tell you that everything you love about traditional marketing can be easily transferred to inbound marketing. Today, I love marketing more than I did when I graduated from college. Today, when I go home, I know if I won or lost and I can tell you and every CEO, COO and sales person out there exactly why. As the marketing manager at Imagine Business Development, I look forward to sharing more insights with you about the specifics of inbound marketing. As I learn new things and experience “a-ha” moments, you’ll be the first to know.